Blaze of Battle offers many options to enhance your kingdom. 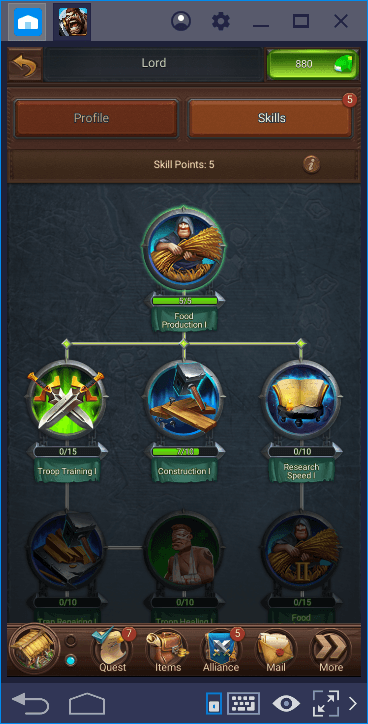 You can do lots of research that will help you in many ways and make your city even bigger by using your own skill points as a lord. To use these systems efficiently, first, you need to know how they work. This is the purpose of this guide: Below, you can find detailed information on what research to focus on and how to use your skills. In order to do research, you must construct the Mage Tower building. You can do this after a few minutes of starting the game, there is no prerequisite. As long as you have the opportunity, we recommend that you upgrade the Mage Tower. Like other buildings, you can upgrade this one to level 21. 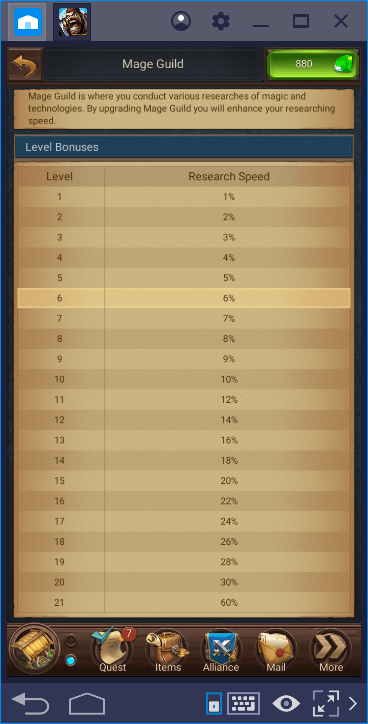 The research speed will increase with every level and a fully upgraded Mage Tower gives you a whopping 60% bonus. Economics Improves resource production and construction speed. Combat Provides speed, attack, and defense buffs to your army. Trap Improves trap training speed. Savage Combat Improves march speed and unlocks advanced units. Savage Trap Unlocks advanced trap types. Advanced Economics Further improves resource production and troop training capacity. Forging Unlocks soul forging ability and equipment forging speed. 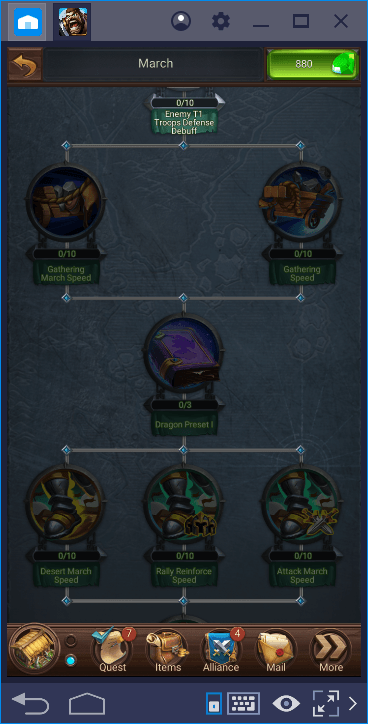 March Further improves the marching speed of your troops. Restorative Improves hospital capacity and healing speed. Elven Combat Enlarges march size and unlocks special tactics for your troops. Dragon Improves the abilities of your dragon. As you can see, the list is quite long and each study consists of multiple stages. In other words, if you want to complete every research in Blaze of Battle, you have to play the game for at least a year! Therefore, it is important to focus on important ones only: Which ones are most useful for you? However, no matter what your game style is, there are some research categories that you must complete. You can see them in the list below. Construction: Increases the construction speed of all buildings by 50%. Resource (Food / Wood / Stone / Iron / Gold) Production: 100% increase in production of these resources. Storehouse Capacity: Increases the capacity of this building by 30%. Gathering: Increases your resource collection speed by 61%. Scouting: Enables you to learn in advance how strong your enemy is. The more you upgrade this ability, the more detailed the report will be. Troop Training Speed: Your troops will be trained 20% faster. 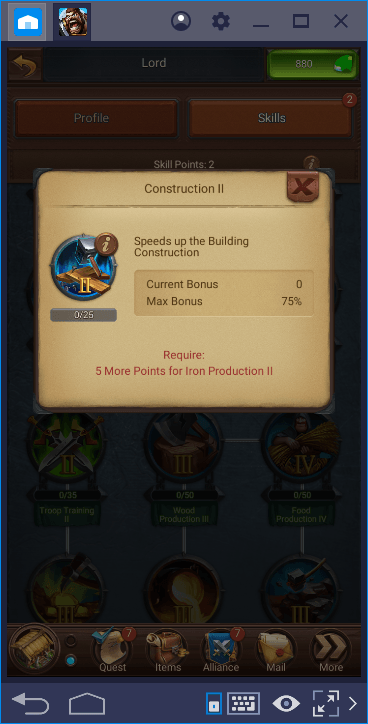 However, you can choose to build 10 houses instead of this research: You will get the same speed increase by doing this and a bonus to gold production, as we mentioned in our Buildings guide. Do the Troop Training Speed research only if you do not plan on building 10 houses. Soul Mastery (Level 1): You have to do this research to unlock Soul forging. Even if you don’t have military goals, you should make sure that your army’s equipment is good. March Speed: Will shorten your travel time on the world map. Also, remember to complete some research that will unlock some types of troops. In particular, we recommend you to research the Storm Slayer, Raider, and Sentinel units. These will be the most useful military units until you reach the end-game phase. Every activity you complete in Blaze of Battle allows you to earn a certain number of XP points. (In our Tips and Tricks guide, you can find information about the different and easy ways to earn these points.) 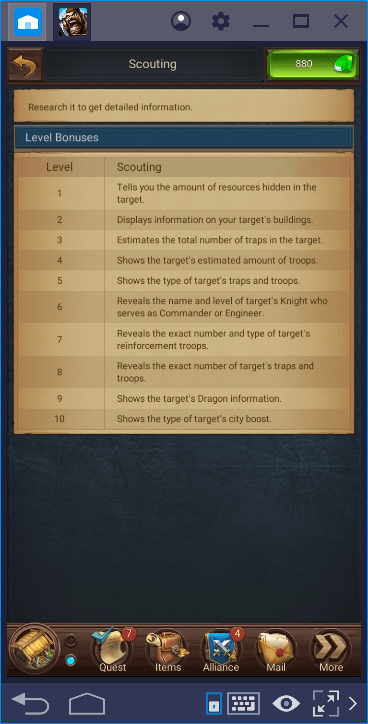 With these points, you can increase your “Lord level”, which is completely independent of your city level. Each time you level up, you earn 1 skill point. With these points, you can make your own private research and further develop your city. 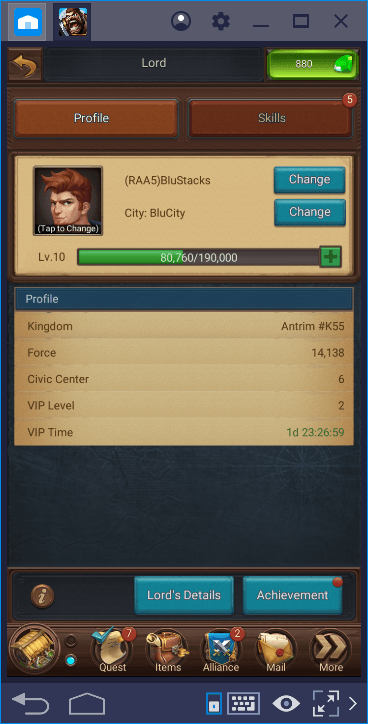 Open your profile screen and press the “skills” button. You will see a list of all the research you can run – each one consists of 5 to 50 stages. For example, you can upgrade the food production research 5 times and increase the level of its bonus. You have to use 1 skill point every time. Resource Production IV: You can increase the production of each resource by up to 350%. Construction II: The speed of building construction will increase by 75%. Gathering III: Resources can be collected up to 150% faster. Research Speed: Allows you to complete research 75% faster. Troop Training Capacity: Increases your army’s training capacity to about 50,000 troops. 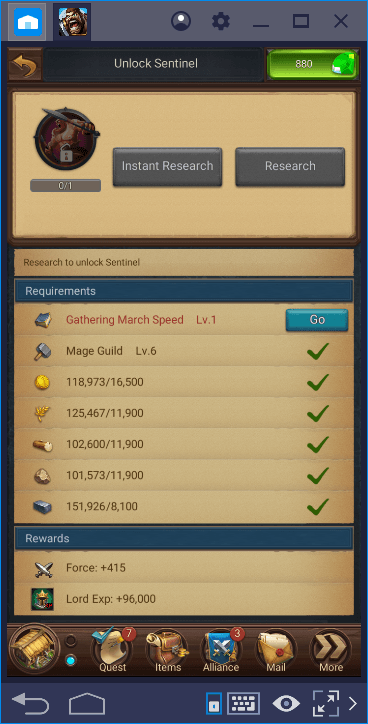 Note that Lord skills can be used in conjunction with Mage Tower research. So, for example, you can complete both of the “construction” research and finish all buildings almost instantly. 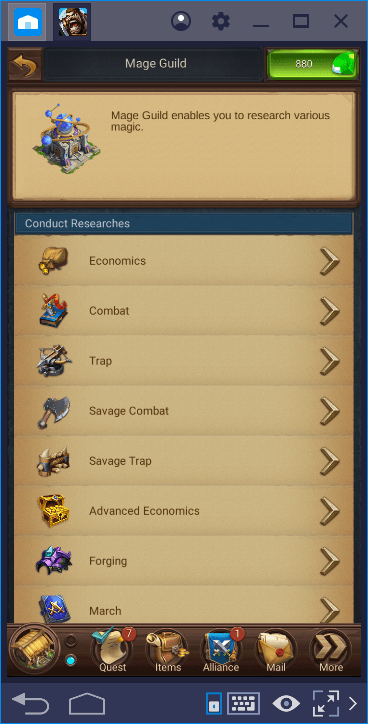 In addition, lord skills do not have a research time, they get activated immediately. 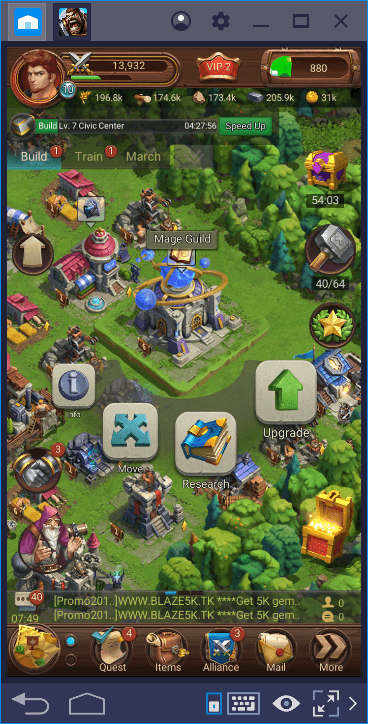 If you want to expand your kingdom further, don’t forget to check out our other Blaze of Battle guides. In particular, we recommend that you take a look at our Buildings Guide: You can find a lot of information there about what is necessary for the healthy development of your city. Your journey in the Blaze of Battle world will be a long but fun one: Good luck!